Money Man is released via Amazon's Video Direct service. ​You can watch our film anywhere, without waiting for a DVD shipment. Money Man - A film about Alexander Hamilton made in association with Duende Drama and Literature. Thomas F. Maguire stars as Alexander Hamilton. In 36 hours he would be dead, from a bullet fired by Vice President of the United States, Aaron Burr. But on this early morning in July 1804, Alexander Hamilton is very much alive as he reflects on his role in the birth of the new United States, his role as a father, his political opponent Thomas Jefferson, Aaron Burr and life itself. Alexander Hamilton (Thomas F. Maguire) talking about a visit to Thomas Jefferson. 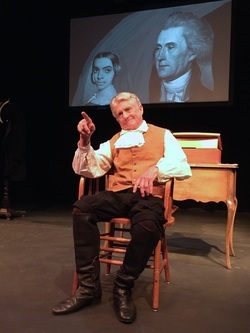 This one act play, written by Rick Foster, stars Thomas F. Maguire as Alexander Hamilton. The play is set in the hours just before Hamilton's duel with Burr. Beautifully filmed in front of a real audience during a live performance, the play leaps from the screen as multiple camera angles allow you to experience the story as though you are actually in the theater. Watch the film online by clicking here. Bookmark this page and check back with us as a lesson plan that will accompany the film is currently being developed. Money Man is an independent production of Duende Drama and Literature and is not affiliated in any way with the current hit Broadway musical Hamilton. If you came to this page looking for information about Hamilton, please click on the Hamilton link here.